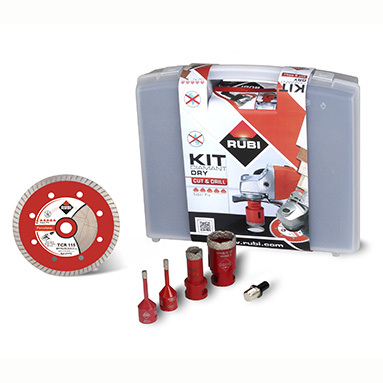 Rubi Dry Diamond Tile Drilling & Cutting Kit - ideal for drilling and cutting porcelain tiles, glazed tiles, natural stone, dry wall and floor ceramics, without the need for water cooling. Rubi dry diamond drill bits are for use with angle grinders, or drills (not hammer action) using the included adaptor. They are capable of drilling around 15-20 holes in porcelain tiles, providing the correct technique and pressure is applied. Maximum operating speed: 14,000 RPM. M14 thread. Diamond drill bits in the following Ø sizes: 6mm x2, 20mm & 35mm. Rubi TCR 115mm diamond angle grinder blade for porcelain.